I understand the theory of music very well. I would like for you to explain how to set up harmony parts for a group and or choir-quartet group for example. A complete answer would fall under the category of vocal harmony arranging. An in-depth study of this subject will provide you with the information and answers you need to fully understand your question. Without writing a dissertation, I will give you a few principles that can be used to create voice parts for a gospel choir. In most genres of contemporary music the voice parts are created in three-part harmony consisting of a high, medium and low voice part. In three-part gospel choirs this will usually be a soprano, alto and tenor voice. The soprano being the high part, the alto being the middle part, and the tenor being the low part. When these three voices are combined as a chord, it’s called three-part harmony. 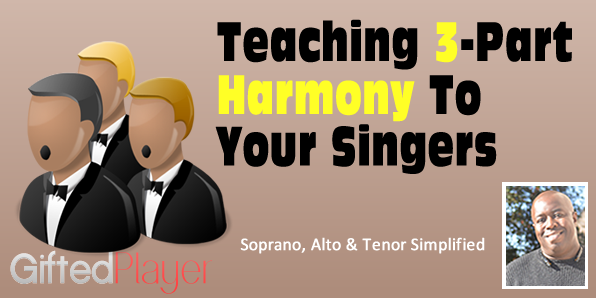 In three-part harmony the sopranos usually sing the melody of the song while the altos and tenors sing harmony underneath the melody. For example, if the choir sang a, Ab major chord in 1st inversion (C Eb Ab) the sopranos would sing the “Ab”, the altos would sing the “Eb” and the tenors will sing the “C”. When creating parts for a choir, first find the melody of the song. 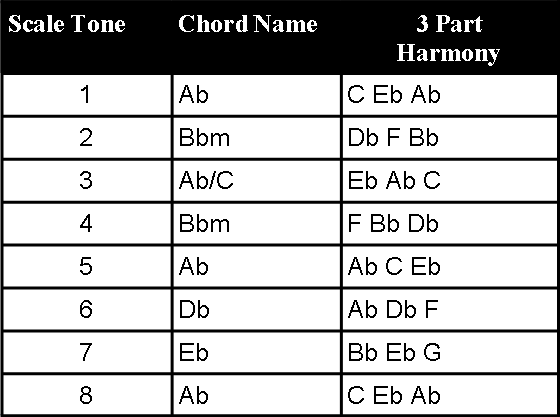 Below is a table of diatonic chords derived from an Ab major scale. 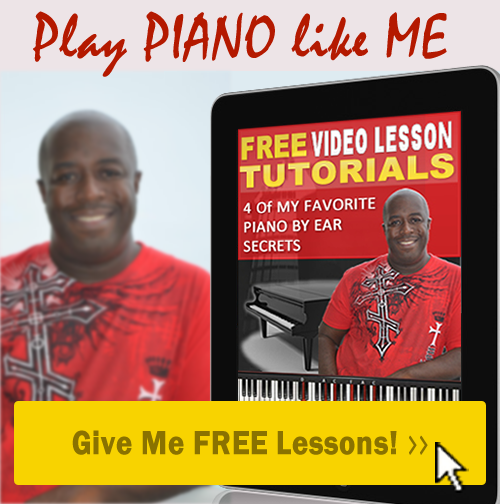 This will provide you with a starting point for creating voice parts. In this table the tenor note is 1st the alto note is 2nd and the soprano note 3rd. Remember, determine the melody first. Let’s apply these chords to the hymn, “Oh How I Love Jesus”. These are the first six notes to the melody of that song: C C Bb C Ab Ab. Now let’s create our voice part by harmonizing the melody. Using the table below, these are the voice parts when we harmonized the melody.